Yesterday’s Special Event unveiled some products which were expected, however it did gave us a shock as Apple announced a next generation full-sized iPad. With this Apple’s annual product release policy came to an end as Apple iPad 3 and iPad 4 debuted in the same year. So what’s the difference between the two? 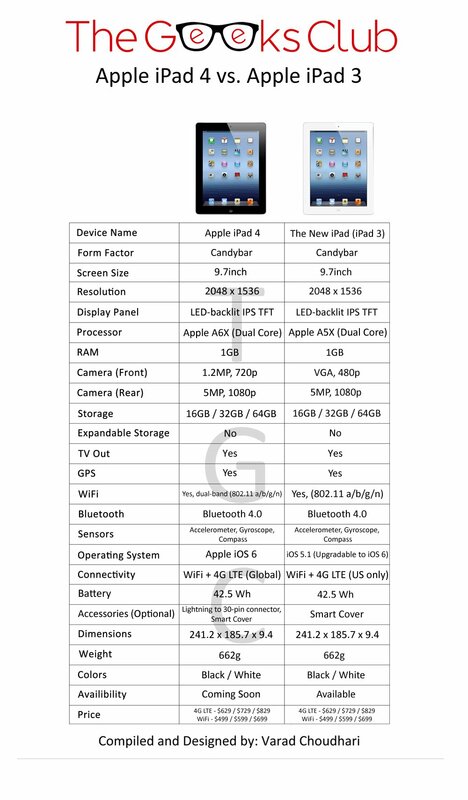 Have a look at iPad 4 vs iPad 3. Apple iPad 4 features the same rear iSight camera, but has upgraded the front-facing camera. iPad 3 came up with 0.3MP (VGA) camera straight from iPad 2. This 0.3MP front-facing camera of iPad 3 has been replaced with 1.2MP HD camera supporting the Retina Display and allowing FaceTime HD calls. iPad 3 was powered by Apple A5X CPU that is the revamped version of Apple A5 CPU found in iPad 2. Apple A5X boasts dual-core CPU and a quad-core GPU to support the Retina Display resolution. And, now Apple announces a new CPU in iPad 4 that is again the revamped version of iPad 3, that’s ‘Apple A6X’. Its Apple tradition to talk less about the hardware internals, that’s why only thing we know about Apple A6X is, it’s twice powerful than Apple A5X. The 30-pin dock connector found in iPad 3 disappears in iPad 4. Instead, Apple adds the 8-pin Lightning Connector of iPhone 5 to the iPad 4. Even though iPad 3 supported 4G LTE connectivity, it was restricted just to the US. The 4G LTE of the iPad 3 didn’t have global support which later created conflicts. That’s why Apple was forced to change the name of iPad 3 from ‘WiFi + 4G’ to ‘WiFi + Cellular’. iPhone 5 is dubbed with 4G LTE connectivity having global support that includes UK’s ‘Everything Everywhere’ network too. Apple has tweaked the 4G LTE support in iPad 4 making it globally supported just like the iPhone 5. The WiFi chip of iPad 3 is replaced with a new faster one. This new chip is dual-band and supports WiFi (802.11n) connectivity on the 2.4GHz and 5GHz bands. These are all the new additions to iPad 4 over iPad 3. Have a look at our detailed comparison chart below. Steve Jobs would never have agreed on iPad 3 and iPad 4 in the same year! Apple has been dishonest with its loyal customers. You can really sense the absence of Steve Jobs. Planning to sell your iPad 3? Well, that will not be a great decision.